Hello, i wonder, when we can order this limited edition ? Thank you for your comment. For the time beeing we can not tell you the exact release date. As soon as we know it we will inform you on our Blog, Facebook and Website. Thanks for your answer ! i hope order this watch ! This looks lovely. 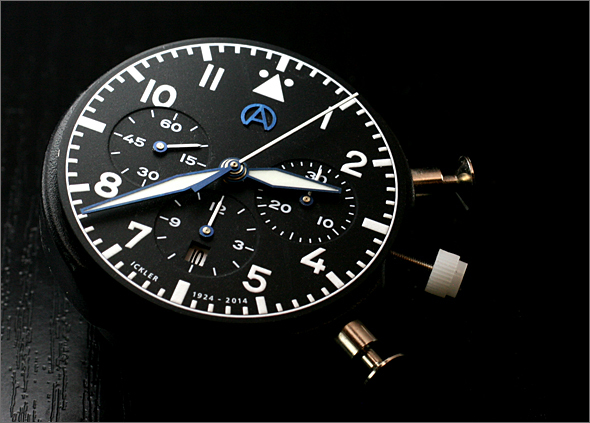 I don’t think I’ve seen another tricompax flieger with this subdial arrangement. Thank you for your comment. Nice to hear! I like the 90 years anniversary pilot chronograph! When will it be possible to buy one? Price? Best regards! J. Thanks for your comment. We can not tell you the exact release date for the Anniversary Chronograph. As soon as we know it we will inform you on our website, blog and facebook. Dear Lisa – Will the case have a pvd or non-pvd finish? Will it be launched by this year or next year? The pictures of this watch make me breathless!!! What diameter will the watch have, please? Will it have a bezel and a steel strap? Thank you in advance! Thank you for your message. The watch will have a 42 mm diameter. As soon as we have more information about the various styles we will let you know on our blog, Facebook and website. Should be in first quarter of 2016. Have a great christmas time and a happy new year. Thank you, thats a perfect size. The movement seems to be an ETA Valjoux 7753, correct? Dear Stefan, the movement will be an 7750 TOP Tricompax. Ups, read over it.sorry ….. (was fascinated by the pictures ;-)) season’s greetings tollen you and the whole Ickler Team! What color will the case be – silver or black? Any updates on the release date yet? Really looking forward to this one!! The case will be in stainless steel. As soon as we know the release date we will let you know. Hello, this is a nice watch, but it looks a bit like the steinhart chronograph NAV B 44 and 47. Still it’s nice, beautiful, hmm, yes, with a blue tip/dot on the central second hand and with day-date instead of date, otherwise without date at all. But what I’m looking for is a rattrapante or flyback, I assume flyback is easier to get by and a rotating bezel with 60m and count-down markers. 10s, 5s, 3,2,1, go, … with nato-strap – all non-retro, just a modern coloured version. Your blue-white approach is a great start. Any idear if this would make sense to you to build it? Thank you for your comment. For the time beeing we do not focus on your requested design. Best regards and thank you for your proposal. I’m very interessed in this watch, do you have more information when the final picture are in the blog an when you can order the watch? Because the first quarter of 2016 is nearly finished. i would be interested in buying this pilot chrongraph. will archived continue to make it? 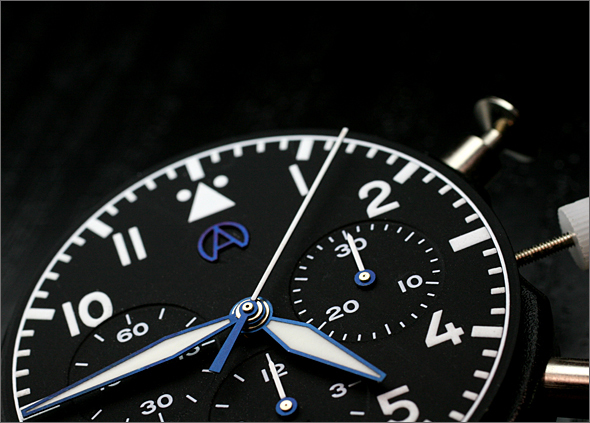 the 90 years Chronograph is sold out. And we won’t continue making it. This was a special limited edition. 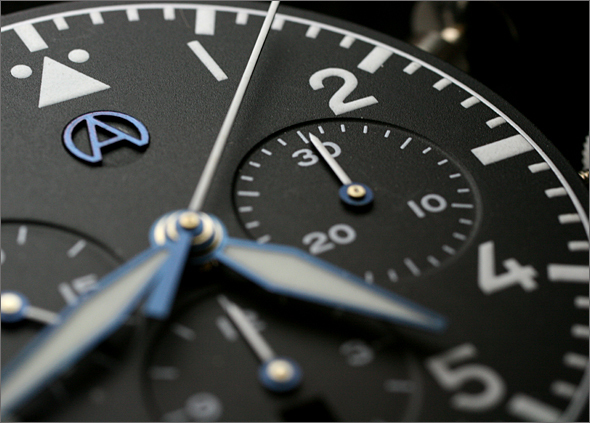 The good news: we will offer soon a new Pilot Chronograph Tricompax on our website. As soon we have more information we will inform on our website / Blog / Facebook. For any questions please contact me at any time. Pilot Chronograph Tricompax??? Whats is this?